Today we'll look at Exodus 28 and 29. Exodus 26 and 27 have continued with the details of the construction of the sanctuary and its furnishings. These chapters move to details about the duties and responsibilities of the priests who serve in the sanctuary. Just to refresh your memory, the LORD had brought Moses and the Israelites to Mount Sinai to make them a holy nation, a kingdom of priests. That is, they were to become Yahweh's special people for mediating His Presence to all creation. Yahweh and Israel had entered into covenant marriage, and now Yahweh was giving instructions for the Tabernacle. Yahweh does not intend to be Israel's husband from a distance, but to move in and dwell in Israel's midst. I don't know how far to press the marriage metaphor, but we might describe the tabernacle as consisting of a bedroom and a dining room. The bedroom is the Holy of Holies room which contains the Ark of the Covenant and its mercy seat covering. Only the high priest could enter this room, and then only once a year to make atonement for the sins of Israel. The dining room is the Holy room, to be entered every day by the priests. It contains a table with bread on it and a lamp stand that is to be lit every night. Thus, the tabernacle is for intimate forgiveness, faithful fellowship, and divine guidance. Yahweh truly does seek to be Present to and among His people. Our text deals with the priesthood and in particular, their garments and their ordination. I am left with more questions than answers as I work through this material, but the two questions that drive me are: (1) What does this text tell me about being a priest among God's people? and (2) What does it tell us about being a kingdom of priests? The dress of the priests is hard to imagine, but from the material used it is apparent that the priests wore uniforms that matched the material of the tabernacle itself. The tabernacle was Yahweh's place. The matching uniforms sent the clear message that the priests belonged to Yahweh. In their dress they were set apart to Yahweh. Often we use dress to set ourselves apart from others, to establish our identities. Here the dress is used to set apart to Yahweh. What does our dress set us apart to? The first item of clothing was called an "ephod." Because there are varying descriptions of what this clothing article was within the Old Testament, we are not exactly sure what it looked like. The "Exodus version" must have been something worn around the waste that also had shoulder pieces that were held in place by suspender like chords (best I can tell). What is significant for our purposes is that each shoulder piece contained an onyx stone upon which the names of the sons/tribes of Israel were engraved (six names on each stone). These were to be a permanent memorial of the sons of Israel before the LORD. Thus, whenever Aaron (or one of his successors) put on the ephod and went before the LORD, he brought Israel with him. To wear the ephod into the Presence of Yahweh was to carry or "shoulder" the people and their needs before Yahweh. Neither Aaron nor Yahweh would be able to forget the purpose of the meeting: Israel. This would have helped Aaron guard against the temptation to serve out of self-interest: Israel was on his shoulders. It would also have brought Israel to Yahweh's mind every time Aaron went before Him. That's not to say that Yahweh ever actually forgot Israel. Rather, the memory language is metaphorical for salvation. To remember Israel is to respond with salvation (note Genesis 8:1, 9:15, Psa 25:7). Aaron went before Yahweh shouldering the people and their needs, seeking Yahweh's saving response on their behalf. That is what priests do. That is what I need to be doing as the pastor/priest of my congregation. But lest you be tempted to say, "Yes, that's what my pastor needs to be doing!" let me remind you that Israel is called to be a kingdom of priests. By extension, Israel as a people is called to shoulder the nations and their needs, seeking Yahweh's saving response to the nations. The apostle Peter, in 1 Peter 2:9, identifies the church as a "royal priesthood." He has transferred Israel's title to the church. We as the Church, not just the church's "official" ministers, are to shoulder the nations, including our neighbors, as we come before the LORD. We must not become merely self-interested pray-ers. We must bring others before the LORD, seeking salvation on their behalf. If we are going to be a priesthood, we must have the names of peoples/neighbors etched upon our shoulders as a memorial to the LORD. I'm afraid that too often we come before the LORD with shoulders bearing only our own names. The next major piece of clothing is the "breastpiece for making decisions." 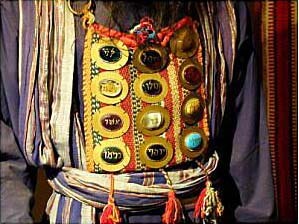 This was some kind of a shield or vest worn over the chest that contained twelve precious stones on it, one for each tribe of Israel. On the chest side of the breastpiece was a pocket containing the Urim and Thummim, two devices that may have been like dice that were used for discerning the decisions and leading of Yahweh. It is significant that each tribe of Israel is represented by a particular gem. Gems are precious because of the way they catch and reflect light, illuminating the various colors of the light prism. God is the One who said, "Let there be light." Scripture also testifies that "God is light." Could it be that these twelve gem stones are a reminder that all twelve tribes are needed in order for the full spectrum of God's light to become visible? Take away one of the stones and a portion of the light prism remains hidden. Each stone, each tribe, is precious and necessary to illuminate the brilliance of the One who is light. I hope you hear in those twelve gems that you, your family, your church, and your ministry are precious and necessary if the richness of the light of God is to be manifested. I also hope you hear that the church down the street or across town or around the world is as equally precious and necessary. It takes more than one stone to capture and reflect the brilliance of light. It takes more than one tribe to display the splendor of the Father of lights. This breastpiece is for decision making. Aaron would wear it as he went before the LORD seeking leadership decisions for the people. No one knows exactly how the Urim and Thummim worked, but one hypothetical possibility is to think of them as "holy dice." Aaron would inquire of the LORD on a particular matter, then take the Urim and Thummim and then roll them like dice. If they came up odd/Urim, Yahweh's answer was no. If they came up even/Thummim, the answer was yes. Yahweh would control the dice, thus revealing His answer. I don't encourage you to attempt this at home (although we probably do it more than we realize) and I don't know if the priests rolled two out of three if they did not like their first answer. However weak this form of inquiry might seem to us, there are two things worth noting. First, where is Aaron to make leadership decisions? He is to make them before the LORD. Too often we make our leadership decisions outside of the tabernacle and then attempt to baptize or sanctify them once they are made. Aaron is instructed to make the decisions before the LORD, inside the tabernacle. If we could learn to do that, we might not have to spend so much energy justifying and sanctifying our decisions. Second, notice again that there were twelve stones on the breastpiece, one for each tribe. All twelve tribes were represented in the decision making process. No one tribe controlled the Urim and the Thummim. The decisions were to be made in the interest of the twelve tribes, the whole people of Israel. That is remarkable. In Egypt, all decisions were made in the interest of Pharaoh. The interest of any others was of no importance. In our democracy there are special interest groups who want every decision to be made as if they are the only group, and then there's the "ordinary" interest group which considers all other interests to be illegitimate. But Aaron was instructed to wear all twelve stones as he inquired of the LORD. Aaron was not to be bought off by the wealthiest tribe or intimidated by the most powerful tribe or controlled by the most numerous tribe. He is not to cater to the interest of any one tribe, but neither is he to disregard a tribe. All twelve, by means of their stones, are brought before the LORD in the decision making process. Only in such a way could just leadership be executed. I honestly don't have much hope that we will ever see "twelve stone" justice in American politics. Do you think we will ever see it in church politics? The ordination service for the priests required the sacrificing of three animals: a bull and two rams. The bull was sacrificed first as a sin offering. Aaron and his sons were to lay their hands on the head of the bull, thus identifying with it and perhaps symbolically transferring their sins to it. The bull was then slaughtered and its blood was sprinkled and poured on the altar. The fat was burned on the altar but the rest of the animal was burned outside the camp. My biggest question is, whose blood did the bull's blood represent? For most of my theological life I would have answered that the blood represented Aaron's blood, that the wages of sin was death and that the bull was the symbolic death of Aaron; the bull was a substitute for Aaron. But now I am not so sure. That might be partially correct, but I do not think it is the whole answer. I am now more inclined to see the bull's blood as representing God's blood. If it were Aaron's blood, where would the forgiveness be? Could the shedding of Aaron's blood ever actually bring about reconciliation with God? Could it atone for sin? I don't think so. Forgiveness comes at the cost of the forgiver. The forgiver somehow sponges up the injustice and bleeds out forgiveness to the transgressor. The transgressor's blood does nothing to heal the relationship. It is the blood of the wounded, the blood of the transgressed, that has the power to cleanse and atone. There is forgiveness in Christ's blood not because a good, even sinless man died, but because Jesus was the Son of God, the One sinned against. God's forgiveness, his bleeding heart, was revealed as Jesus hung on the cross. Only God's blood can overcome sin. Following the bull sin offering, the first ram was sacrificed as a whole burnt offering. As Aaron identified with this sacrifice he was totally and utterly relinquishing his life to God. As the whole animal was offered up to God, no meat being pulled out of the fire, so Aaron was giving himself to God. The second ram was a fellowship offering. The fat was burned up to God; the meat was cooked for Aaron and his sons. The blood was sprinkled on the altar, and also smeared on the right ear, right thumb, and right big toe of Aaron. Why the ear? Well, who was Aaron supposed to listen to? For fellowship with Yahweh to be maintained, Aaron needed to give his ear to Yahweh. Why the thumb? No matter which fingers we use, we use them in conjunction with our thumb when we work or pick things up with our hands. Aaron's thumb/hands were to be given over to doing the work and touching of Yahweh. Fellowship would be maintained through the work of the thumb. And why the big toe? Aaron's steps were to be ordered by Yahweh, that he might walk with and worthy of Yahweh. See the progression in the offerings: From a sin offering to an offering of total relinquishment to a fellowship offering. Isn't that the journey we are all on? We experience and re-experience the forgiveness of God in Christ Jesus. We hear and (hopefully) heed, often over and over as our lives change and expand, the call of Christ to surrender our entire selves to His lordship without reservation. We journey in fellowship with the Lord, listening to His voice, doing His work, going where He wants us to go, endeavoring to live worthy of His name. This is a journey not just for those designated as official priests. It is to be the journey of the whole church, the whole kingdom of priests. A major shift takes place at the close of the ordination service (Ex. 29:44-46). Up to this point Yahweh has been telling Israel through Moses to consecrate this and consecrate that. To consecrate something is to make it holy, to set it apart to God. Now at the close Yahweh says, "I will consecrate . . .." Israel may set something apart to God, but it doesn't really become holy until God comes and sets it apart to Himself. Ultimately, only God can make something holy, for only God is holy. The good news is that as Israel renders unto God the things God has asked for, God comes and accepts those things unto Himself, making them truly holy, and establishing His Presence among and through His people. May we render ourselves unto the LORD, and may the LORD likewise consecrate/sanctify us, establishing His holy Presence in our midst. It’s about ears, thumbs, and toes.